Today’s post is brought to by another incredible meal from Home Chef. Yes! Last month I raved about this service when I made Baja Fish Tacos. 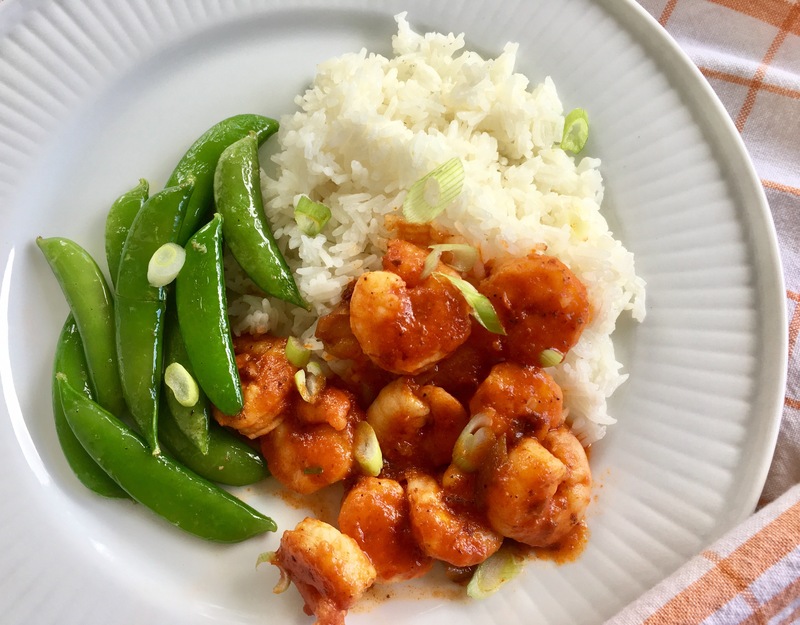 This time I made Shrimp with Tiger Sauce and Charred Sugar Snap Peas. This experience was just as amazing. Before taking on the box of tasty ingredients, I read through the entire recipe as suggested. I also rinsed all of the product to be used. Now it was time to cook! The recipe started with the preparation of the Jasmine Rice. I LOVE Jasmine Rice!! It’s so fragrant! I knew that it would be perfect for the flavors that I was working with. Next, I had to prepare the snap peas, by removing their strings. I also thinly sliced the green onions then set them aside to sear the shrimp. After cooking the shrimp until charred, I removed them from the pan. Now this is the part I loved, the recipe said to use the pan I just cooked the shrimp in, to cook the sugar snap peas in! Yes! With the exception of the Jasmine Rice, this meal is made in just one pan. I love it!! After cooking the sugar snap peas, I removed them to a plate and finished the shrimp. (In the same pan!) After adding the remaining ingredients that made the Tiger Sauce, I was ready to plate! Top to bottom this delicious meal only took about 30 minutes! Amazing! Another great experience from Home Chef! Fresh ingredients delivered to my home, prepared by me. Thirteen new meals for me to choose from each week. Home Chef is also “conscious about the impact (their) services has on the Earth” and ships my meal box using recycle and reusable materials. What is there not to like about Home Chef?? Get started with your Home Chef experience today with $30 OFF YOUR FIRST PURCHASE!! *This is a sponsored post in partnership with Home Chef. All opinions are that of my own.